Brewer Description: (from bottle) India Pale Ale brewed with wheat and fermented with brettanomyces. 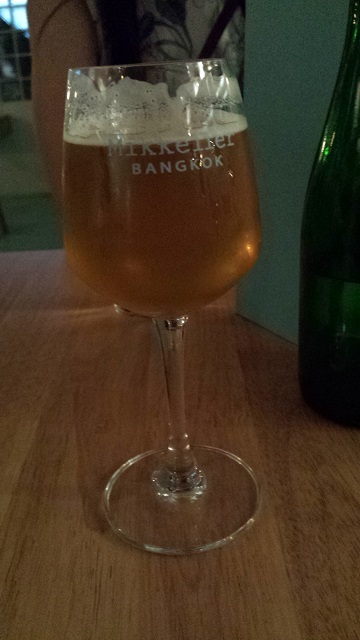 Intro: A 200ml pour on draft at Mikkeller Bangkok into a mini stemmed wine glass. Appearance: A slightly hazy golden yellow colour with a two finger white head with decent retention and nice clingy lacing. Aroma: Brett funkiness with a mix of tropical pineapple, mango and citrus lemon, grapefruit aromas. Taste: Fruity much like the aroma with mango, pineapple, orange and grapefruit, whereas the brett here brings a tart and leathery element. Overall: This was very nice and balanced and very easy to drink. If I could get my hands on some bottles, I would definitely pick up a few.